Finally! Internet Call is now available on the web Phone app. Initially, users could trigger a phone call from the web portal to their mobile phone. Now, Hoiio users can make outgoing calls from the web browser straight to their recipient’s phone. Go to the Phone app. 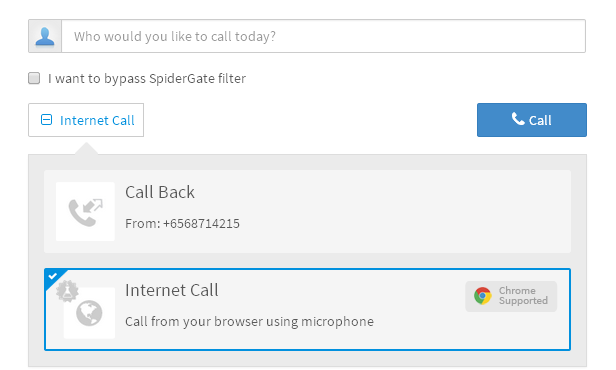 Click on ‘Call Back’ to expand the options, then select ‘Internet Call’. Previously, this feature wasn’t available on the user portal due to technology limitations. With the introduction of webRTC, an open project that enables real-time communication capabilities on browsers, we were able to use this technology to build web Internet Call. webRTC allows users to make voice and video calls over the browser without installing any plug-ins. This means you do not have to download any application to make these calls. As webRTC is still new, our app team is putting this out as a beta project. We’ll need some time to stabilise the system and work out any kinks. We believe that every product can be further enhanced for better user experience, and your feedback can help us do just that. Currently, Internet Call is available on Chrome. Ensure your desktop is equipped with a microphone in order to try out Internet Call. Let us know how your experience goes! If everything turns out well, Firefox support will come soon.